This security research paper is the first of two examining the HL7 messagiang standard, which is arguably the most fundamental flaw in healthcare IT. HL7 is used extensively for system-to-system communications and is in nearly every healthcare facility worldwide. The first paper is an overview of what can be done with stolen medical data, what HL7 is, as well as potential dangers inherent to HL7. The second paper moves beyond theory and is an in-depth, technical discussion on ways to attack and defend HL7. There is some degree of overlap between the two as both papers needed to stand on their own. In fact, limiting the overlap ended up being one of the biggest challenges in the two-part presentation of the research. Even if the reader is familiar with HL7, I would strongly suggest reading both in their entirely and not skip ahead. The link to the second paper is immediately below. The papers are also now posted to the SANS Reading Room. I’ve included the link to “HL7: Understanding the Fundamental Flaw in Healthcare.” Feel free to add comments or ask questions below even if you download the paper from the SANS Reading Room. In case you are wondering about my background or how someone in security came across this… Prior to full-time security and consulting work, I served as a Systems Integration Specialist (interface engineer and systems monitoring) for a hospital with 40+ HL7 interfaces. It was my first real job while still in college and I stayed in that position for some time after I graduated. A majority of that position focused on getting various hospital systems to communicate via HL7 interfaces. In a way, I was kind of thrown in the deep end of a Cerner to SMS (Shared Medical Systems and later Siemens) interface configuration, which was considered one of the more challenging integrations at the time. Fast forward and while consulting on multiple security projects (standing up SCCM, deploying Win7 with BitLocker, vulnerability assessments, etc.) for a large hospital system just a few years ago, the interface analyst resigned and I was asked to fill in temporarily until the position was re-hired. Realizing the insecurities of these communications many years after my Systems Integration Specialist stint, I was appalled to find absolutely nothing had changed in that realm in well over 10 years. To make matters worse, new systems were being implemented via the same insecure means. Ask healthcare IT professionals where the sensitive data resides and most will inevitably direct attention to a hardened server or database with large amounts of protected health information (PHI). The respondent might even know details about data storage, backup plans, etc. Asked the same question, a penetration tester or security expert may provide a similar answer before discussing database or operating system vulnerabilities. Fortunately, there is likely nothing wrong with the data at that point in its lifetime. It potentially sits on a fully encrypted disk protected by usernames, passwords, and it might have audit-level tracking enabled. The server may also have some level of segmentation from non-critical servers or access restrictions based on source IP addresses. But how did those bits and bytes of healthcare data get to that hardened server? Typically, in a way no one would ever expect… 100% unencrypted and unverified. HL7 is the fundamentally flawed, insecure standard used throughout healthcare for nearly all system-to-system communications. This research examines the HL7 standard, potential attacks on the standard, and why medical records require better protection than current efforts provide. 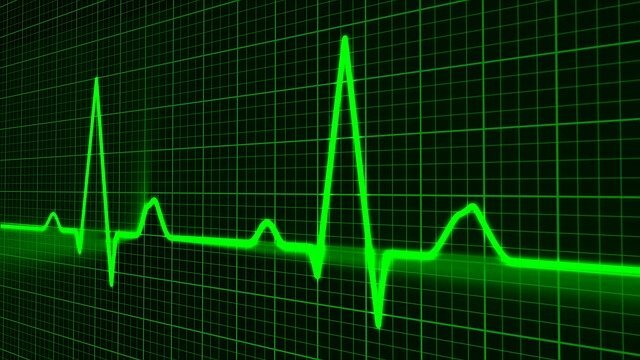 In comparison to other industries, healthcare contains some of the most sensitive and valuable data to an attacker. Although the cost for a stolen electronic health record (EHR) on the dark web has dropped from previous years, complete EHR databases have recently sold for as much as $500,000 (Chickowski, 2017). EHRs are highly valuable to criminals because individual records and the databases that contain them are a wealth of information. According to Fuentes, “EHR data is unique in a way that it includes protected identifiable information (PII), along with medical, insurance, and financial information” (2017). 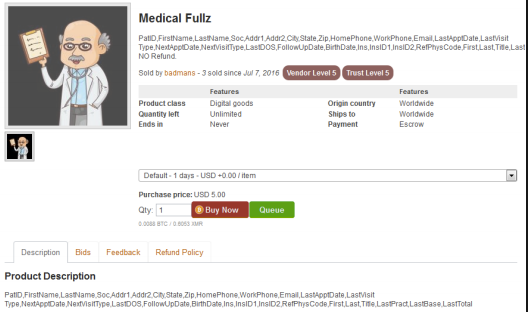 Figure 1 depicts the sale of individual medical records on a dark web marketplace. Healthcare essentially becomes an all-in-one stop for data. With all the data in one location, this opens the door to a wide range of illicit opportunities on the black market and dark web. Medical records contain full names, physical addresses, social security numbers, driver’s license information, email addresses, and dates of birth. One can even frequently find answers to common secondary security questions, e.g., past addresses and phone numbers, place of birth, relatives (and related information), employer information, and much more. If a cybercriminal is interested in running scams for fraudulent tax returns, healthcare has it. If an attacker wants to steal an identity and sign-up for credit cards, healthcare has information for that too. Healthcare even has all the data necessary to perform fake prescription refills. A single EHR contains the data for any of these illegal activities. Healthcare is known for its regulation and significant penalties for data breaches. Given the rising costs associated with a breach and the value of stolen healthcare data, one would assume it is extremely well-protected. Unfortunately, that could not be further from the truth. Healthcare is considered abysmally behind in its cybersecurity efforts: “The health care industry definitely lags all other industries, except maybe higher education” (Bur, 2016). Depending on the measurement methodology, some estimates place healthcare firmly behind other critical industries by as much as five to ten years. Criminal organizations are targeting healthcare data more than ever and there is a somewhat lackadaisical approach to securing medical data. Meanwhile, there is a strong desire to connect everything related to healthcare causing additional burdens. Connectivity has proved to be a double-edged sword healthcare has only started to understand. As stated by the Health Care Industry Cybersecurity Task Force, “Patients and physicians have derived many benefits from EHRs including giving patients the ability to access their information through portals and giving providers the ability to more easily share patient information. However, this digitization resulted in an increased attack surface…” (2017). Healthcare has arguably felt the need for data sharing and data connectivity far more and far longer than any other industry. The prolonged and ever-increasing connectivity has added many legacy standards, applications, and devices over the years. The past and present push for more connectivity could add layers of difficulty to securing healthcare environments because it is a constantly moving target. Understanding the importance of safely handling medical data and providing secure connectivity in healthcare is not complete without a discussion of the HL7 standard. However, in most discussions, HL7 is entirely forgotten because it operates behind the scenes. Health Level 7 (HL7) provides “a framework (and related standards) for the exchange, integration, sharing, and retrieval of electronic health information” (Introduction to HL7 Standards, 2017). HL7 is the underlying standard that provides a common syntax for systems to interoperate with one another and share information. It is important to note that there are multiple versions of HL7, namely version 2 and version 3, with a newer standard on the horizon. Version 3 does offer many improvements, although it is not backwardly compatible. For this reason and many more, version 3 never supplanted version 2 and it is still not as widely adopted (Corepoint Health, 2017). Consequently, this research focuses on version 2 of the HL7 standard although similar security issues exist in version 3 as well. The goal of healthcare IT has long been the exchange of patient health data and the ability to send and share data accurately with other disparate systems. This data transfer is important if a patient’s insurance or address has changed, but also if a bed number changes during a hospital stay. It ensures patient data is accurate throughout a visit while also providing speed in patient care. An example of speed in patient care is the drastically reduced time to transfer radiology and lab results from ancillary systems to the primary system most hospital personnel use. HL7 communications assist in this function by eliminating most manual data entry, facilitating the delivery of time sensitive information and reducing the number of errors. It is rare, if not impossible, to find a single hospital system that performs all the necessary medical functions from beginning to end. Even a small, limited care facility will typically have several systems to support patient care or back-end business tasks. For example, a small facility might have an ancillary system for pharmacy functionality in addition to their primary system which performs a bulk of the hospital duties. In a way, HL7 provides the two systems with a similar language to communicate with one another. This standard means of communications facilitates the data flow between two systems as seen in Figure 2, thereby allowing the overall hospital to function more efficiently. If a small facility does not have an in-house lab, it may have an HL7 feed to an external lab to eliminate manual data entry or the faxing of patient data and orders. Even in a small environment, it simply is not possible for someone to manually input data into each of those systems. In a slightly larger hospital, the facility will likely have a financial/admissions system, a few drug/supply dispensing machines in patient areas, a lab system, and a separate radiology system. Rather than create simple point-to-point interfaces, the hospital may also incorporate an interface engine to assist with the data interchange between these systems. 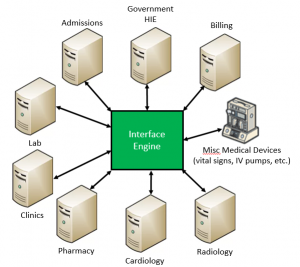 An interface engine (aka integration engine) is a go-between for different systems that monitors different types of interfaces and communication points and performs actions according to rules defined by the organization (Orion Health, 2017). As part of its core functionality, an interface engine replicates HL7 messages to multiple systems while formatting the messages to meet the needs of individual receiving systems. Suddenly, the simple two-system configuration described previously has grown significantly. This growth continues as the relative size of a hospital and the number of services increases. As represented in Figure 3, a large facility could require the primary admitting system to send patient record data to several systems – lab, billing, radiology, pharmacy, and maybe even a government health information exchange (HIE). HL7 data may also flow back from any of those systems or miscellaneous medical devices (such as those used for collecting vital signs, IV pumps, or other patient centric data) to the clinician charting application. An HL7 interface connects systems, however, HL7 data is not typically flowing between them non-stop. Instead, HL7 messages are sent on an as-needed basis when an event triggers a message. The contents of HL7 messages vary wildly even though the standard establishes message structure to some degree. Every HL7 message begins with a message header (MSH) segment and it “defines the message’s source, purpose, destination, and certain syntax specifics” (HL7 MSH – Message Header, 2017). An HL7 message itself is little more than text with field delimiters as shown in Figure 4 below. In the example MSH segment, one can see the delimiters in use immediately following the ‘MSH’ text. The message used the standard and recommended values – ‘|’ is the field separator, the ‘^’ is the component separator, the ‘~’ is the repetition separator, the ‘\’ is the escape character, and the ‘&’ is the sub-component separator. Following the delimiter field are the sending and receiving fields, a date/time field, the type of event, and other miscellaneous information. The “required” data fields found both inside and outside of the MSH segment are heavily dependent on the receiving system and the HL7 standard itself. ADT (admissions, discharges, and transfers) messages are one of the most widely used HL7 message types. These messages are primarily for patient administration. ADT messages carry patient demographic information as well as information about patient visits/encounters. When a hospital admits a new patient, an outbound ADT message will most likely trigger although this is once again dependent on the needs of receiving systems. More specifically, if the patient visit is a standard admission, then an ADT-A01 message much like the example in Figure 5 is sent. The A01 is an event type within the ADT message type that specifies it is an admission and not a pre-admission, discharge, etc. If the patient switches to a new room or bed, an A02 (transfer) or A08 (patient update) message might get triggered instead. There are numerous other ADT message types and they can cover a variety of activities including patient registrations, changing an inpatient to an outpatient, or canceling events. Different HL7 message types have structural commonalities and contain similar, sensitive data. In the ADT example, the message has an MSH segment, but it also has an EVN (event) segment and a PID (patient identifier) segment. Many of the HL7 message types will have the EVN and PID segments as well as other required segments. The HL7 standard guides the data structure for the various message types. Table 1 below shows some “security significant” ADT data fields along with their segment and field number followed by the information contained in those fields from the ADT example. ORM (order) messages are general orders that can refer to materials or services, for example, ordering a drug such as morphine or requesting a blood screen. An ORM message, as previously indicated, shares many commonalities with other HL7 messages. However, a segment only found in order-related messages is the ORC segment. The ORC segment specifies order details and can include fields such as who ordered the test/drug, who entered the information, quantities, etc. ORM messages may also have OBR segments detailing additional order information. Figure 6 is an example ORM message. For clarification, some pharmacy dispensing systems require a pharmacy/treatment encoded order (RDE) message for drug ordering versus a standard ORM message. ORU (observation result) messages are used to send test results to another system, generally in response to a previous order (ORM). In the ORU message example below, a complete blood count (CBC) was ordered, evident by the contents of the 4th field in the observation request (OBR) segment. The results for each of the 14 different tests performed as part of a single CBC are found in their respective observation (OBX) segments/fields. In the OBX-3 field of the 8th OBX segment (OBX|8) is the identifier for a red blood-cell count (RBC) test. The RBC test results had a value of 4.02 (OBX-5) and the standard range for this test (based on lab guidelines) is between 4.07 and 4.92 (OBX-7). Since this value was below the expected range, it received an abnormal flag of ‘L’ (low) in OBX-8. Orders with non-numerical results such as x-rays or cancer screens may have textual data in the OBX segments or note (NTE) segments. While there are several other message types including well-known ones such as SUI (for scheduling) and DFT (detailed financial transactions for billing), the last type discussed here is ACK (acknowledgment) messages. Although HL7 communication does not always use ACK messages, understanding ACK usage is essential because it can cause messaging failures if excluded. In some cases, an ACK is sent immediately after a message is received. There are instances where return messages are only sent after the receiving system has 1) succeeded in processing the message (ACK), 2) received the message, but processing failed such as the error message below (also an ACK, but with description), 3) or failed processing (NACK). Another outcome is the lack of any returned messages. Failure to receive any indications back can mean the receiving system is down or not processing messages at that time. For a more complete listing of HL7 message types and field-by-field specifications, please reference https://corepointhealth.com/resource-center/hl7-resources/hl7-messages. The overview on the value of stolen health records and the data contained in HL7 messages helps convey the need for security in healthcare. Regrettably, HL7 could not be any further from addressing that need. The HL7 standards body states, “In the Security TC we have assumed that encryption happens below the application layer, e.g., via IPSec or TLS, not within HL7 messages” (HL7 International, 2007). HL7 International created the standard with a strict focus on the OSI (Open Systems Interconnection) application layer, leaving security as an implementation detail. This concept means that despite the sensitivity of the data, HL7 is sent and received as clear-text with the potential of encryption between the endpoints. The lack of encryption in HL7 and the relative insecurity of healthcare coincides with recent survey results from HIMSS (Health Information and Management Systems Society). As depicted in Figure 9, the HIMSS Cybersecurity Report estimates only 64.0% of U.S. based provider organizations (e.g., hospitals, physician offices) encrypted data in transit (n.d.). It is highly possible this number may have been increased by survey respondents either overlooking the usage of HL7 or the belief that a VPN (virtual private network) or some other means is securing the data. Overall, the transmission of HL7 messages is similar to the insecurities found in FTP (file transfer protocol) and older implementations of SMTP (simple mail transfer protocol). Somewhat ironically, even today interface engines often utilize FTP to perform batch transfers of HL7 messages. 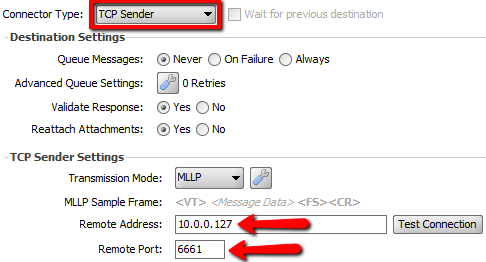 Individual HL7 messages or batch transfers are also still sent using SMTP. A conventional store and forward interface example is the accumulation of individual financial (DFT) messages. Following the message collection, the single file gets sent to a billing system (possibly external to the network) via a daily FTP batch. The HIMSS Cybersecurity Report did not detail why the data in transit numbers were only 64.0%. One possibility is that while HL7 might fly under the “not encrypted” radar, FTP is a promising reason for why survey respondents chose “no” when asked if their data was encrypted. Standard FTP has well-known insecurities and if it exists in an environment, the IT department staff is most likely aware of it. Without further clarification of how the question was asked or the technical knowledge level of the person answering the questions, it is impossible to know if the survey results are high or low. It also raises the issue of whether HL7 or FTP were taken into consideration when answering the questions. It might come as some surprise that HL7 provides an even lower level of security than FTP. Unlike FTP, HL7 does not require any authentication nor is there any way to include authentication when establishing a connection. FTP is avoided entirely in most environments due to numerous security concerns. Meanwhile, an overwhelming majority of healthcare facilities use HL7 for some of the most sensitive data imaginable even though it is a security nightmare. As shown in the two configuration screenshots below, a standard HL7 interface is nothing more than a destination IP address and TCP port on a source system with a corresponding listening port on a destination system. As with any insecure messaging, there are numerous opportunities to attack the underlying communications. If the attacker can gain access to the same network, the possibility for ARP (address resolution protocol) poisoning or ARP spoofing is extremely high. ARP spoofing is relatively easy to perform and it allows an attacker to intercept all communications between two systems using a packet sniffer. This process is also known as eavesdropping since neither the sending nor receiving system is aware of the intermediate system or redirection. 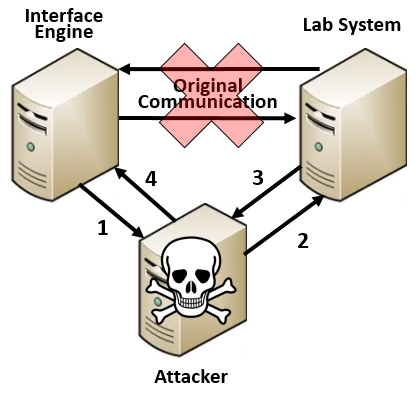 In Figure 12, an attacker uses ARP spoofing to intercept the communications between an interface engine and a lab system. This MITM technique allows an attacker to gather PHI or even modify network traffic in real-time with potentially fatal outcomes. An attacker may establish a foothold in an environment to quietly collect stolen medical record data and eventually use it for identity fraud or other financial gains. As shown in Figure 13, when used in conjunction with a MITM attack the captured HL7 message is easily recognizable when displayed in Wireshark. After the data capture phase, the data could be sent off-site periodically and the collection process restarted. If no service disruptions occurred with the actual HL7 interfaces, this data exfiltration could conceivably continue for weeks, months, or even years without detection. The relative size of the facility and the number of patient encounters are the only limiting factors in the number of collected records. The motivations for other attackers may go beyond simply collecting data. Another potential attack involves the manipulation of HL7 data. A cybercriminal could remove entire HL7 DFT messages to eliminate billing charges. The attacker could also cause mass disruption by swapping patient names on patient-viewed results or billing statements. Technically speaking, each of those “minor” mix-ups is a data breach requiring substantial legwork to correct. Other consequences may include fines from the breach and the loss of patient confidence in the facility. A malicious attacker could also make changes with far more nefarious intentions causing bodily harm or even death. An attacker could modify simple HL7 data such as the weight of a patient. An incorrect weight sounds harmless enough during a routine check-up, but it could drastically change the dosing for numerous drugs associated with ongoing treatments. Another attack might result in the improper dosing of a chemotherapy drug or additional drug orders before and after a shift change. It is unlikely the receiving system would alert technicians or pharmacists when requested dosages are over a certain limit or prescribed more frequently than usual. Falsified test results could also drastically change a patient’s care plan. Very rarely, if ever, would anyone identify this type of data tampering and thus, it is currently the responsibility of hospital staff to manually detect these anomalies. Consider the hypothetical scenario of a high-level politician targeted by a nation-state or high-level cybercriminal organization. It is not outside the realm of possibility for one of those bad actors to attempt an assassination wielding HL7 as a weapon. As described earlier, HL7 ADT messages have allergy segments and HL7 also sends drug orders. Now consider the target was severely allergic to penicillin leading to anaphylactic shock. When admitted to the hospital, the attacker could modify the ADT AL1 segment to read “no known allergies” for the target. The attacker could follow-up the falsified ADT message with an order for penicillin. This attack scenario goes beyond a single penicillin allergy as there are thousands of other allergic reactions or drug interaction possibilities to consider as well. The de facto standard healthcare has used for years to communicate is not going to change overnight. It is not as if there has been a competing standard for the past 30 years where only a handful of interfaces are affected. Even if the industry moved to a new and secure standard tomorrow, there are hundreds of thousands of HL7 interfaces in operation today. Security-oriented changes to HL7 and other insecure transports would allow their continued usage without a complete replacement. Improving the security of existing interfaces could save a significant amount of cost and time while still protecting sensitive data. First, encryption must be deployed wherever possible, especially in instances where health data is traversing different network segments or the Internet. Most often, an encrypted solution will involve sending the data over a VPN tunnel. In the case of an actual point-to-point VPN tunnel, this may be all that is needed. An SSH tunnel could provide similar security gains as a VPN. Other benefits of an SSH tunnel include less vendor involvement, fewer configuration changes, and an easier setup. If a VPN or an SSH tunnel is not a viable option, another possibility is the use of network segmentation to help secure HL7.While network segmentation will almost always improve security, it does not necessarily eliminate the risk. Proper segmentation is also notoriously difficult for interface engines. By their very nature, interface engines must communicate with numerous outlying systems. This communication requirement often results in interface engines sitting on a “lowest common denominator” network segment, i.e., a network segment that can communicate with nearly everything on an internal hospital network. The problem with this approach is a simple email phishing attack or browser-based malware infection can give an attacker access to valuable medical record data. Data handled by the interface engine is far too sensitive for this to occur and at the very least, the interface engine must reside on a different network segment than standard user workstations. Applying static ARP entries is another, under-utilized means of preventing HL7 MITM attacks. As with other HL7 fixes, static ARP entries will likely involve vendors, change control, and will have budgetary impacts. A static ARP entry would ensure the systems could only communicate with media access control (MAC) address tied to a related IP address. This defense mechanism would prevent a rogue system on the same network from gaining a foothold via ARP spoofing. However, static ARP entries would do little to protect the sensitive data in transit as the interfaces would still communicate as clear-text. Thus, if an attacker gained access to network hardware such as a router or switch between the HL7 interface sender and receiver, the data would pass unencrypted and completely visible. Re-architecting any working solution in the name of improving security is often met with backlash and interfaces are no exception. Some complex interfaces were multi-month or multi-year efforts. In many cases, the interface engineer who developed the interfaces may not be with the organization anymore. Even simple interface modifications such as changing an IP address can involve a substantial amount of planning. The potential for downtime also exists if someone forgets a minor technical detail in the process. Despite the roadblocks and possible missteps, securely re-architecting existing HL7 solutions must be performed to secure the data and limit would-be attackers access to it. Healthcare needs a better means of system-to-system communication. After all, the most frequently used version of HL7, version 2, was created in 1989 (HL7 Frequently Asked Questions, 2017). Fortunately, there is a new standard known as Fast Healthcare Interoperability Resources (FHIR) and it promises to revolutionize how healthcare data is shared. The creators of the HL7 standard, Health Level Seven International, also created the FHIR standard. FHIR uses an application programming interface (API) that allows for much easier data access. It achieves this via an HTTP-based RESTful protocol in either XML or JSON formats. FHIR has its benefits, but corrections to underlying issues must occur before its widespread adoption. In the FHIR security section, the HL7 organization states “TLS/SSL SHOULD be used for all production data” (HL7.org, 2017). The problem is should is not synonymous with required or must. The standard further distances itself from guaranteeing encrypted traffic by also stating “the service base URL will specify whether SSL is required” (HL7.org, 2017). Securely implementing FHIR does not have the appropriate guidance from the standards body. When added to the increased complexity of configuring SSL/TLS certificates and the reduced ability to troubleshoot network communications, healthcare may see security eliminated from real-world FHIR implementations before it gets off the ground. Undoubtedly, the lack of built-in security measures will lead to what the IT and InfoSec industries have seen time and time again, i.e., the easy install of today will become the gaping security hole of tomorrow. Healthcare itself and various technical standards bodies have not adequately answered this challenge up to this point. Thus far, government intervention has fallen short as well. Most healthcare professionals recognize HIPAA (Health Insurance Portability and Accountability Act) as the attempt of the government to steer the healthcare ship in the United States. Right or wrong, much of HIPAA has previously focused on patient privacy and policy instead of deep-seated technical security issues. That stance changed to some degree in the Omnibus Security Rule update in 2013. Still, the guidance found in the revised rule was left open to interpretation and those interpretations can vary wildly. For instance, something as simple as workstation security has no implementation specifics and instead says workstations should be protected from unauthorized use (AHIMA Practice Brief, 2013). The rule does not specify if a username and password are sufficient or if secondary measures such as biometrics or two-factor authentication (2FA) are needed. After all, it is reasonable to believe a malicious insider or an outside attacker could gain unauthorized access via stolen user credentials. The rule also does not specifically mention the use of full-disk encryption (FDE) for data at rest, which would further protect against unauthorized use. While it is common to use FDE on laptops to protect data if they are lost or stolen, FDE on servers is infrequently used or recommended in healthcare. The lack of understanding where sensitive data is stored or the lack of regulatory requirements may underscore this oversight. The important takeaway is that despite interface engines receiving and storing massive amounts of PHI, they do not draw the same level of scrutiny as other devices where PHI is not stored. Whether discussing data in transit or at rest, the HIPAA Security Rule falls short by simply stating that encryption be addressable rather than required (Snell, 2015). Essentially, if an organization cannot encrypt the data, someone should be prepared to explain why it is not feasible. The rule has shifted more toward required over time, yet required is still not mandatory in all instances. With regards to data in transit, the HL7 standard does not support encryption. The FHIR standard does not require SSL/TLS so a vendor may not support it, thereby preventing the organization from utilizing it. If a breach occurred, it is unclear whether those prior justifications would satisfy the “addressable, not required” guidance from the HIPAA Security Rule. Healthcare communications such as HL7 need security measures added for both existing and new installations. Its successor, FHIR, should require encryption to achieve compliance with the standard. The bottom line is that for sensitive medical data, the question of whether the communications are secure or not should not vary from one implementation to another. Protecting medical record data or any medical device is nothing more than a pipedream without secure communications as the standard in healthcare. As it is today, HL7 will continue to be the “data privacy hell of communication” as security researcher, Hannes Molsen, described it to the FDA and other U.S. government agencies (Capital Reporting Company, 2016). Furthermore, discussion on not only device security, but the security of inter-system communications is necessary to move the industry forward and ensure “we will have a safe system, not only safe boxes in an insecure system” (Capital Reporting Company, 2016). In many ways, outside forces including the government, patients longing for access to more data, and even healthcare itself have unintentionally created the perfect storm placing everyone’s data at risk. The perils associated with not securing healthcare data are endless and that will not change in our data-driven, connected world. The value of medical records is simply too high for criminals to cease their assault on healthcare and the potential usage of HL7 and EHRs for malicious purposes is far too great to ignore. At a minimum, the healthcare industry needs to focus on improving security across the board and achieving the same level of security as other critical industries – finances, utilities, and retail. Without significant improvements, healthcare will continue to be nothing more than low-hanging fruit with high rewards. As with any issue and particularly those in information security, this challenge will only get addressed once light shines on the problem. Healthcare needed better security yesterday and change needs to happen. The security woes found in healthcare were not created overnight and there are no quick and easy solutions either. Healthcare communications standards must have security built-in so the new implementations of tomorrow, next week, and next year can realize significant improvements day one rather than as an afterthought. The healthcare industry will require time to make long-lasting improvements and those advances need to start now. Medical data is far too valuable to continue neglecting security. Thank you for these articles. As you might have guessed, these are making the rounds on HL7 listservs. We have the topic of needing to update HL7 v2 Privacy and Security guidance on next week’s Security WG call @ http://wiki.hl7.org/index.php?title=November_14,_2017_Security_Conference_Call. You welcome to join this or a future call to discuss. I’ve uploaded links to your articles and some older HL7 Transport Security specs about which you may not be aware @ [http://wiki.hl7.org/index.php?title=HL7_Version_2_Privacy_and_Security#Need_to_Update_HL7_V2_Chapter_1_Security_and_Privacy_Content. Kathleen, I will connect with you privately via email. Thanks!